Am I the only one who can’t get enough asparagus lately? I have dozens of ways to enjoy it, but I’m always open for more. This recipe from Laura Calder caught my eye and I was intrigued. I don’t think I’ve experienced the asparagus orange combination before. So we cooked it up last night and … it was so good! A delicious warm asparagus salad! With roasted asparagus, a fresh and bright orange dressing and Paremsan shavings. 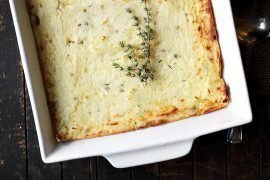 Great Spring or Easter side dish! The original recipe called it an orange sauce. To me, it’s more of a dressing, since it’s juice whisked with shallot, mustard and olive oil. No matter what you call it though, the fresh orange with the roasted asparagus was definitely a winning combination. I used a regular old naval orange for my version. With a few nice orange varieties still available at the market, it would be fun to try something special (thinking Cara Cara would be awesome). I also loved that the shallot was soaked for a bit in vinegar, as it was like a quick pickling and added another layer of flavour. The bit of mustard and the generous Parmesan sprinkling were also nice. 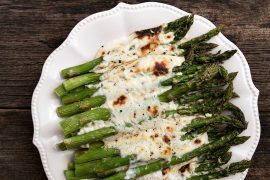 Finally, I’d suggest breaking out your best olive oil for this one and only roasting your asparagus until tender-crisp, so it stays a nice bright green. Anyway … I thought I’d share, for others looking for new asparagus taste experiences. 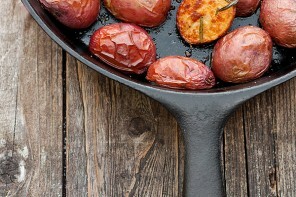 I also think it would be lovely on an Easter table, especially since it was delicious both warm and at room temperature. 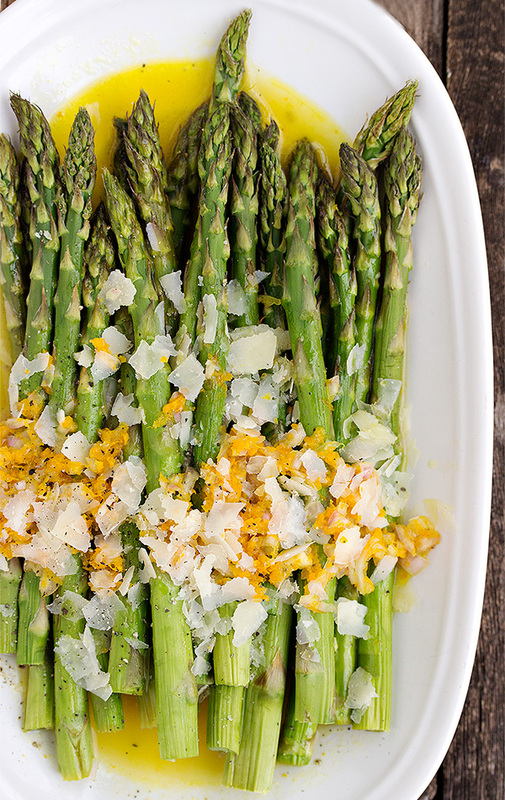 A fresh take on Spring asparagus, with a lovely orange dressing. This dish is delicious both warm and at room temperature. Perfect for Easter dinner or brunch. Preheat oven to 375° F. Arrange asparagus in a single layer on a baking sheet. Drizzle with a bit of olive oil and shake pan to coat asparagus with oil. Sprinkle with salt and pepper. Roast in pre-heated oven for 5-8 minutes (depending on thickness of asparagus) until just tender-crisp (so they stay a nice bright green colour). Meanwhile, make the dressing. Zest 1 orange into a medium bowl. Set aside. Juice both oranges and boil the juice down in a small saucepan over medium heat until reduced to about 3 tablespoons (No need to strain now, as you will strain later). Mince the shallot and put it in a small bowl with the vinegar poured over. Set aside 5 minutes. Add the mustard to the bowl with the zest. When the orange juice has reduced, strain it over the zest mixture. Drain the shallots, discarding the vinegar and add the shallots to the zest mixture. Whisk it all together, then slowly whisk in the olive oil a bit at a time. Taste after 2 Tbsp. and add a bit more if you feel it needs it for balance. Season with salt and pepper. Set aside. Once asparagus is cooked, arrange on a serving platter (something a little dished and not flat, as sauce is thin). To make it look pretty, using a slotted spoon, spoon some of the zest only across the top of the asparagus, about 1/3 up from the bottom, then spoon some more of the full dressing over top. Sprinkle with freshly shaved Parmesan and a bit more salt and Pepper. Nice warm or at room temperature. This looks so simple but so gorgeous! Your photography is amazing too! Asparagus is so wonderful this time of year. Pairing it with an orange dressing and salty parmesan sounds just divine. Thanks Kate. The combination was really delicious. We really enjoyed it, Carrie. A nice change from the usual asparagus. Sounds so delightful! I swear I just saw a batch of Cara Caras come in at the market down the street. I love asparagus so! The dressing sounds great, I am a quick-pickled onion (anything!) fan of course! Thanks for sharing! Thanks Sophie. If you try the Cara Caras, let me know how it is! I love vegetables in any form and shape but my biggest problem with salads is that they are cold and uncooked. This recipe’s got it all! Love it, it will be a perfect for an Easter side! Thanks. I’m the same, Julia, particularly at dinner time. I need warmth on my plate, so loved that this one had that covered. I love this recipe so much. I am making asparagus recipes like crazy right now! Thanks Katrina. The asparagus has been really good this Spring, too! This looks gorgeous! Can’t wait for asparagus to start showing up at the local farmers market here in WI! We can’t get enough of asparagus around here either. Inspiring dish! I love things that can be served at room temperature as an option. I have some nice asparagus and a bag of fresh Florida oranges so it’s on the menu for tonight! I agree, Dale. Always nice to have some dishes you don’t have to worry about keeping hot. Enjoy! I love a warm salad, this would be perfect for Easter – the orange dressing sounds delicious! It was lovely, Laura. I really enjoyed the combination.